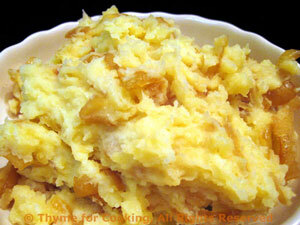 Mashed Potatoes with Caramelized Onions, Thyme for Cooking easy side dish. The caramelized onions add a bit of sweet and the horseradish adds a bit of hot, making these a great accompaniment to roast meats... with or without gravy! Cook in boiling, salted (1/4 tsp) water, partially covered, for 15 - 20 minutes, until very tender. Peel and cut onion in half through the stem end. Cut into thick slices, then cut the slices in half. Heat oil in nonstick skillet over medium heat. Add onions and sauté until very tender and starting to brown, about 25 minutes. Stir in sugar and cook, stirring, until sugar is melted. Keep warm. To assemble: Put milk, horseradish and mustard in a small bowl and stir or whisk well, to break-up mustard. Add to skillet with the onions and heat through. Drain potatoes and mash with potato masher or fork. Add the onion/milk mixture and stir well to combine.